We are looking for more Tyre Fitters in Petersfield, Hull, Rotherham, Warrington and the Devon Area. You can apply using our online application form. If you think you can contribute to a successful and expanding company, get in touch! 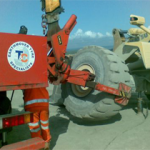 T&C Site Services is the largest, independent earthmover tyre specialist. We are the first choice for many earthmover, industrial and waste recycling operators nationwide for tyre management, fitting and repairs.